Wow! What a weekend it has been. Yesterday at 12pm I started my CARAT* Red Carpet experience with a fabulous Hair Appointment at Knightsbridge Salon, Michael John. After my hair stylist, Serkan, perfected my big and bouncy blow dry I was whizzed away to the oh-so glamorous Corinthia Hotel to spend time with the CARAT* team at their Style Suite. 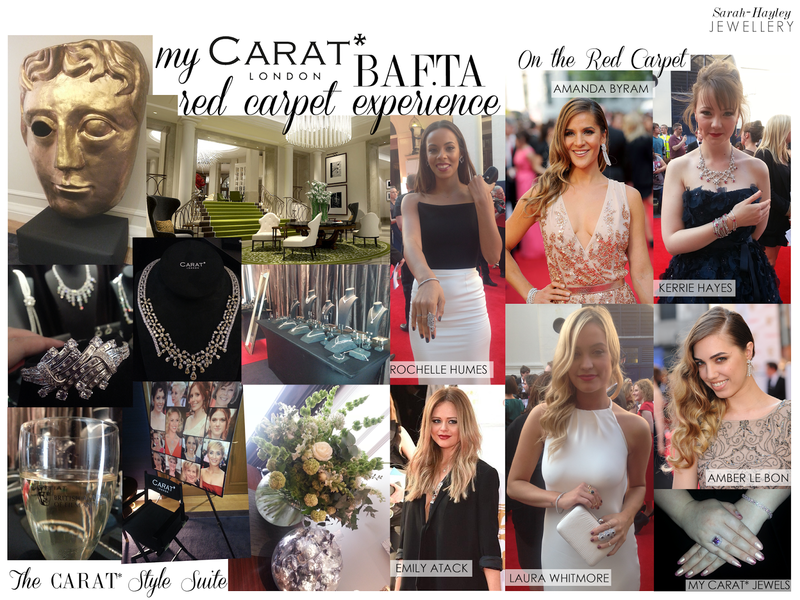 As you walk through the hallway you are greeted by a giant BAFTA and the stars sashaying to and from the many suites. CARAT* are joined at the Style Suite by the Mark Hill hair team, St Tropez, MAC and House of Fraser. As I entered the CARAT* suite I found the first sign of a red carpet which was in the middle of the room, leading to a mirror surrounded by flashbulbs. The atmosphere was electric, the pre-ceremony preparations were in full swing. Some stars were walking around in rollers, others were bringing in their dresses from House of Fraser to team with their jewellery and a handful were ready to go. In the CARAT* suite to the right and left of the red-carpet were the most beautiful of CARAT* jewels, proudly displayed and sparkling. I sipped on Tattinger Champagne while taking note of all the pieces the stars could be wearing to the awards. For my Red Carpet moment, I chose two pieces from the CARAT* Fancy Pink Collection. It was a surprising choice as I do not normally opt for pink stones, although I was stunned by radiance of the 3CT pink centre stone ring, which was also surrounded by a border of white stones. To compliment the ring I chose a subtle pink bracelet and studs. Wherever I went my chosen jewels were admired, even when I was washing my hands in the ladies, one female presenter asked to try on my ring! We both cooed over the sparkle and I promised to look out for her later. The Red Carpet entrances began at 5pm and I took my place in the press pen ready to spot all the stars sparkling in CARAT*. My favourite look was from MTV presenter Laura Whitmore, who looked perfectly polished in a White halterneck column dress by designer Charlie Brear and two eye-catching pieces from CARAT*, a white stone bracelet and striking armour ring, which is an exciting piece as it is yet to launch online. You can see the other stars who shined on the red carpet above and on my #CARATLondon twitter feed.